Thermal Fusion Technology allows the EOD operator an additional layer of critical information while prosecuting complex IED’s. It allows information that would normally be lost whilst using the HD Color view or the standard Thermal view, to be visible to the user. Using Thermal Fusion Technology, the image shows which components are energized, thus generating heat whilst not losing the non-energized components in the thermal “bloom”. It also provides, by way of edge identification, the operator a clear view as to the layout of the device based on its thermal signature. The ability to switch from one view to the other allows for a significant improvement in information gathering to aid in RSP development. The left image is thermal only and due to non-energized components not radiating heat it is clear that not all elements of the device are visible and significant information is lost. The far right image is HD Color and shows component layout but does not indicate the status of the circuitry. The Thermal Fusion image, in the center, shows both the energized components and the layout of the device, allowing the user to determine component status and positioning without losing any critical detail. Thermal Fusion technology is made possible by two video sensors: a High-Definition 1280x720p monochrome CMOS sensor with excellent low-light sensitivity, and a Longwave infrared (LWIR) thermal imager. 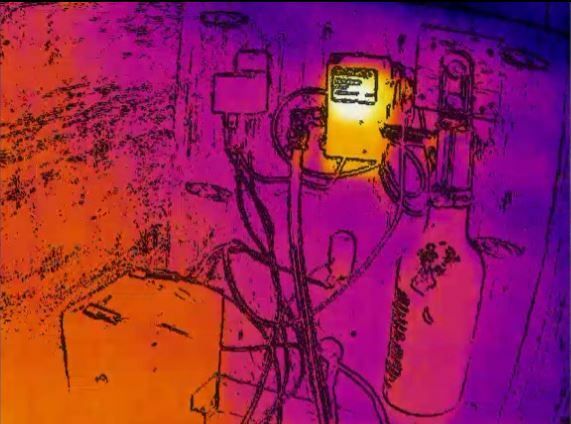 Video from the High-Definition camera is used to produce a blended image of both sensors, delivering physical detail that surpasses what is available from a lone thermal imager. Objects and persons are clearly defined with color and outlines when the Thermal Fusion view is used. Which CORE Cameras feature Thermal Fusion Technology? The CORE Pole Camera and CORE Flex Camera feature Tactical Electronics’ Thermal Fusion Technology. Read more about the differences of standard thermal vs. thermal fusion in this post.